RailJET® is a patent-pending technology that utilizes a modified jet grouting process explicitly intended for railroad soft-subgrade soils stabilization, for stiffening super-elevated curves, and improving bridge approach subgrades to limit excessive dynamic loading onto the bridge structure. The Hi-Rail mounted equipment uses a high-pressure, horizontal jet of fluid to mix existing soil with a cementitious slurry. Used in areas with limited track windows or where extensive earthwork would be impractical or impossible, RailJET® is ideal for limited access areas and rapid emergency stabilization necessitated by track settlement or sinkhole formation. 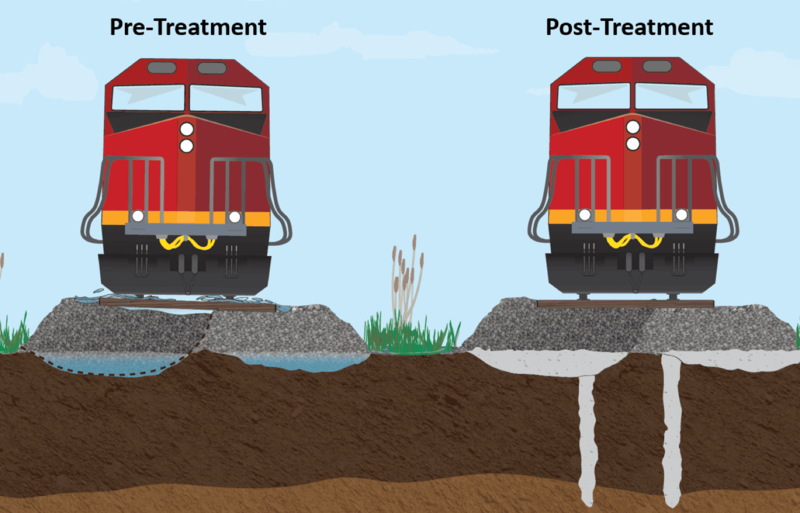 A hydrodynamic mix-in-place technique producing a soil-cement column, RailJET® improves/reinforces the soil both in bearing and shear. The diameter of each column is dependent on actual in-situ soil conditions, but generally ranges from 8 to 16 inches. The process also inherently fills ballast pockets where they exist.